Drew and Madeline Farthering celebrate their six-month anniversary by attending a fancy Regency era costume party. Drew is glad to see Talbot Cummins, an Oxford classmate, and his fiancée, Alice Henley, though many present seem worried about the couple. Everyone's concerns are realized when, at the concluding grand ball, Alice dies of an overdose of cocaine. Tal refuses to believe she took the stuff intentionally, and Drew is determined to find out if her death was an accident or murder. Drew is shocked and disillusioned when the police arrest Tal's father and reveal that the man has been smuggling drugs into the country for the past twenty years. Reeling from the death of his fiancée and the revelation about his father, Tal begs Drew to find out what's going on. Drew, now questioning his own ability to see people as they really are, does so reluctantly, not ready for the secrets he's about to uncover--or the danger he'll bring down on everyone he holds dear. 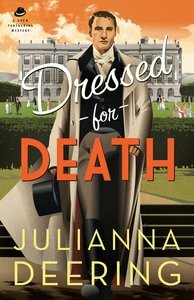 About "Dressed For Death (#04 in Drew Farthering Mystery Series)"
Customer Reviews For "Dressed For Death (#04 in Drew Farthering Mystery Series)"
Drew is the quintessential English gentleman, both in manner and situation, and I love the understated way in which Julianna Deering portrays his wit and charm. I also love that we are continuing with Drew and Madeline beyond their marriage and that Deering portrays their affection and regard for one another with a subtlety that eschews cheesy displays of affection. The opening of the book is light-hearted as Drew and Madeline arrive at Winteroak House for a Regency-themed house party. Julianna Deering captures the atmosphere of the house party perfectly, and uses this time to draw attention to the underlying tensions. After the murder occurs, the novel begins to take on a more sombre tone. Drew is shocked by the arrest that takes place immediately following the murder, and when a second death occurs he begins to question whether he is doing more harm than good in his role as amateur detective. But the snide Inspector from Scotland Yard is more concerned with closing in on a drug smuggling ring than he is with the deaths that have occurred, and Chief Inspector Birdsong isn't convinced the second death is a murder at all. Finding out what really happened is the least Drew can do under the circumstances, but a fistful of airtight alibis and a few obscure, and possibly meaningless anomalies, doesn't give him much to go on. Julianna Deering gets the mood, the language - everything, in fact - just right.